Exercising and being active is important to everyone regardless of age and current fitness level. A regular exercise routine helps strengthen muscles, relieves stress, controls weight gain and best of all exercise increases endorphins and boosts your mood! Unfortunately patients suffering diabetes, arthritis, obesity and the elderly are prone to mobility restrictions making it difficult for them to get a regular workout the gym. Having a condition that limits your ability to move does not mean you can’t exercise; this article outlines tips and specific exercises that are designed to get you moving and attain your goals! Before starting a new workout routine, get medical clearance from your doctor, not a friend or personal trailer. Your medical professional has a complete understanding your condition and can recommend activities that are suitable for you that will not aggravate preexisting conditions. It’s also important to pace yourself when starting with a new activity. Trying to accomplish fitness and exercising goals too quickly can result in an injury and loss of motivation. Setting short-term goals like improving your mental state and reducing stress helps your confidence and gives you more motivation to reach your long-term goals. Warming up cold muscles and joints is a must before every workout. Starting a workout by stretching and doing slow range-of-motion exercises increases blood flow and reduces the risk of injury. Do not exercise if you experience pain or discomfort as pain is your body warning you that it doesn’t like the way it is being used. 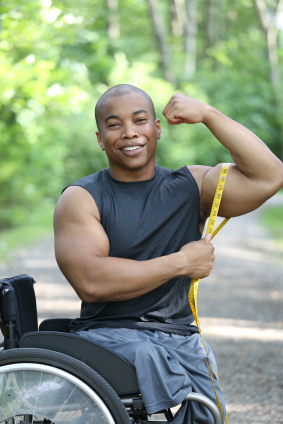 The below list’s contain exercises for the lower body, low mobility cardiovascular exercises and specific upper body workouts for people in wheelchairs. Save money today with MMAR Medical’s SUMMER SPECIAL deals. Enjoy 10% off Breg, DonJoy and Ossur products using coupon code’s BREG10, DONJOY10, OSSUR10. Please note these coupons are valid on regularly priced inventory and cannot be combined with wholesale pricing discounts or other sale priced coupons. First time customers can use our SHIP75 free shipping coupon with them, though!